We love a good rainbow. But did you know that not all look the same? Some can be brilliantly bright and colourful and some can appear faint or dull. So when can you see the best ones? The clearest appear when the sun is shining brightly behind you. Dark storm clouds behind them also help – the dark backdrop will allow the contrast of the colours to stand out more clearly. They appear because, thanks to the storm clouds, there are trillions of tiny raindrops floating in the air. 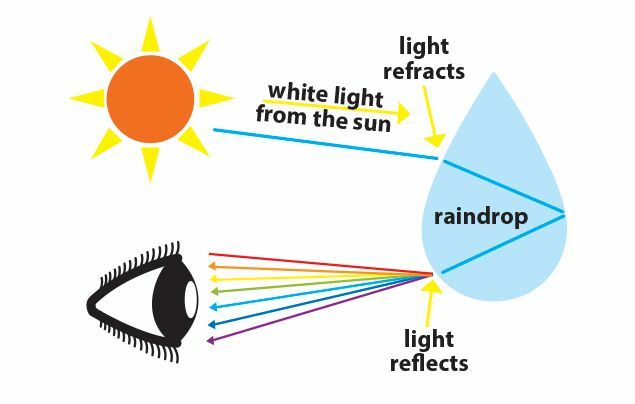 White light from the sun enters each raindrop, refracting off the inside of the raindrop and back into your eye. The water splits the white light into all the colours of the rainbow, just like through a triangular glass prism that you might have seen in a science light experiment! This sounds very simple, but it took thousands of years to work it out. Even geniuses like Aristotle (in Greece 2,300 years ago) and Ibn al-Haytham (in Persia 1,000 years ago) couldn’t understand it! A Chinese scholar, Shen Kuo, finally figured it out – about 1,000 years ago. 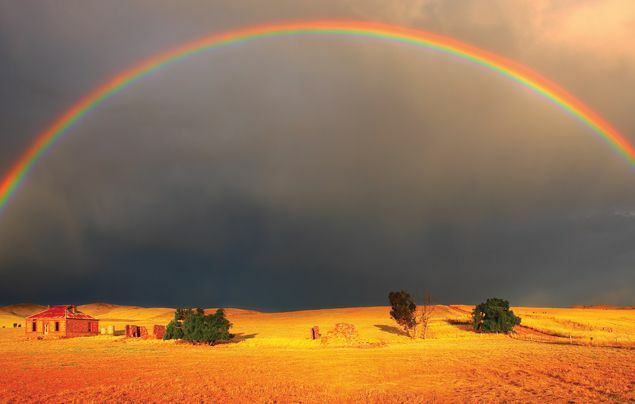 If you’re lucky, you might see a ‘double rainbow’ – a second arching above the first! Take a close look and you’ll see the colours are reversed on the outer one – red will appear on the inside rather than the outside. Awesome! DID YOU KNOW? Your shadow will always be aimed directly at the middle of a rainbow. DID YOU KNOW? Everybody views them differently. The person right next to you is seeing it from a set of water droplets that are different from the water droplets that are creating the rainbow you see! DID YOU KNOW? The word ‘spectrum’ can be used to describe the colours of the rainbow. DID YOU KNOW? You see a semicircular rainbow only because the ground is in the way! Look out of the window next time you’re in a plane – you might see a full circular one around the shadow of your plane on the clouds!